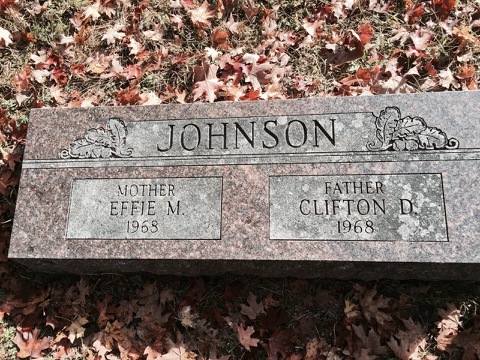 My parents sent me a text today with a picture of the grave marker for Clifton D. Johnson (d. 1968) and Effie M. Johnson (1890-1968). These are my Dad’s paternal grandparents. My Mom & Dad are on a bit of an epic trip which happened to place them near Fayetteville, Arkansas. Dad noticed that this is only a short distance from Jane, Missouri, where his grandparents had owned 120 acres at one time.